Horror-anthologies seem to become increasingly popular. The producers who brought us the two “V/H/S”-films, who I thought were only so-so, now give us “Southbound”, which fares slightly better. It still suffers from the same problem that most of these anthologies have, namely the varying quality of the individual segments, but at least, they did a far better job when it comes to its framework. They’re still not quite as interconnected as, say, in “Trick R’ Treat”, but the way in which one leads to the other was quite interesting. Plus, I absolutely loved the final transition, which offers a hellishly clever reveal that gives “Southbound” an Esher-like quality, ultimately elevating the entire movie for me. The individual segments, though, were mostly ok. I quite enjoyed the first one, especially the interesting and nightmarish monster design, but – and that’s a problem that many such anthologies face – given the short amount of time that we spend with them, I didn’t really feel any sort of connection to the characters. That we only learn later on how they ended up on the highway doesn’t help either. Nevertheless, it was alright. The second segment was my least favorite one. Not that it was particularly bad, but I felt that it mostly wandered on already well-trodden paths, without really adding anything new and/or interesting. It’s directly followed by the strongest segment of the lot, about a car accident, and the driver’s 911-call. Dark, mysterious, atmospheric, disturbing and quite surreal, I loved every minute of it – especially its outcome. The fourth segment doesn’t quite reach the same heights, but it also was quite ok, telling the story of a man who has it set in his mind to save his sister. It offers a nice twist at the end, and is one of the strongest indications that all those stories take place in hell, or purgatory, or something like that. Finally, we end on another strong note, with the story of a family on vacation – something that quickly takes a dark turn, and offers up a nice twist of the home invasion-formula. 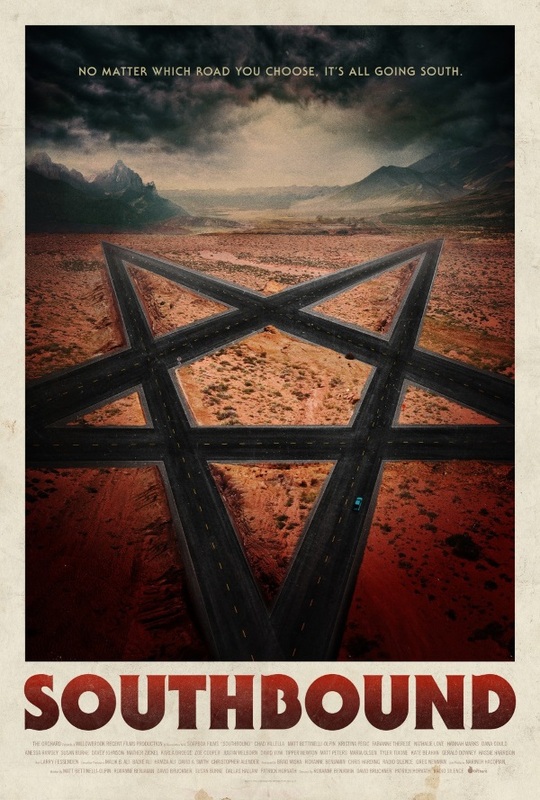 “Southbound” might not be the best horror anthology that I’ve ever seen, but if offers a couple of really strong segments – and even the weaker ones still weren’t all that bad. Its biggest strength, however, is the way the stories are connected with each other – something, however, that you can only really appreciated once you’ve reached the “end”. Thus, horror-aficionados definitely should consider joining these lost souls on their road trip to hell. This entry was posted in /slash, cinema 2016, movie reviews, new releases and tagged /slash, /slash 2016, 2016, anthology, cinema, David Bruckner, horror, ov, Patrick Horvath, Radio Silence, Roxanne Benjamin, Southbound, USA. Bookmark the permalink.